(WILMINGTON, Del., January 10, 2018) – AstraZeneca today announced that BYDUREON® BCise™ (exenatide extended-release) injectable suspension 2mg is now available in pharmacies across the United States. 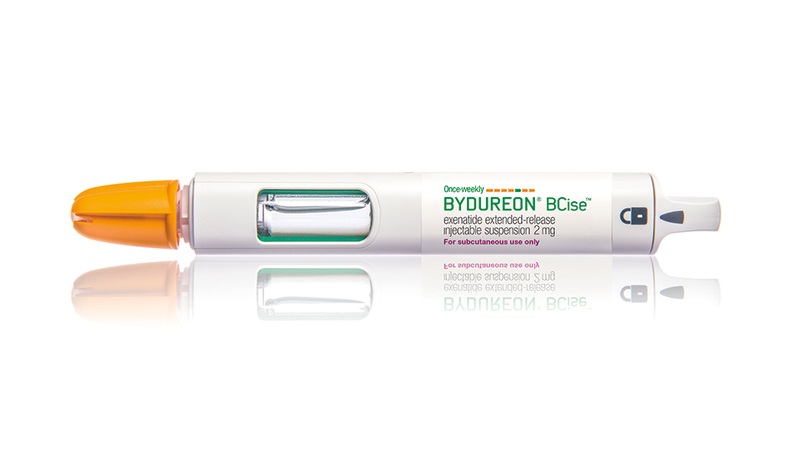 BYDUREON BCise was recently approved by the U.S. Food and Drug Administration for adults with type-2 diabetes whose blood sugar remains uncontrolled on one or more oral antidiabetic medicines in addition to diet and exercise, to improve glycemic control. BYDUREON BCise is a new formulation of BYDUREON®(exenatide extended-release) injectable suspension 2mg in an improved once-weekly, single-dose autoinjector device. It is designed for patient ease and convenience in a pre-filled device with a pre-attached hidden needle. The new formulation of BYDUREON BCise is proven to reduce blood sugar levels and may have the added benefit of weight loss, although not a weight loss medicine. The medication is administered in three simple steps – mix, unlock, inject. Across two clinical trials, average HbA1c reductions of up to 1.4% and average weight loss of up to 3.1 pounds were achieved when used as monotherapy or as an add-on to metformin, a sulfonylurea, a thiazolidinedione, or any combination of two of these oral antidiabetic medicines at 28 weeks. The most common adverse reactions reported in ≥5% of patients in clinical trials were nausea (8.2%) and adverse events associated with injection-site nodules (10.5%). AstraZeneca is committed to supporting patient access to BYDUREON BCise. Eligible commercially insured patients may pay as low as $0 for BYDUREON BCise every month. For more information visit www.BydureonBCise.com. Please see full Prescribing Information and Medication Guide for BYDUREON BCISE and full Prescribing Information and Medication Guide for BYDUREON. Our commitment to diabetes is exemplified by the depth and breadth of our global clinical research program. This commitment is advancing the understanding of the treatment effects of our diabetes medicines in broad patient populations, as well as exploring combination products to help more patients achieve treatment success earlier in their disease.